Just a quick post to let you in on a little (not quite secret) tip. Vinogirl met up with a good friend at Artisanal Restaurant in NYC last night, a glorified French bistro known for their massive cheese selection. It was an annual get together for our husband's November birthdays and, although certainly aware of the occasion, I didn’t mention any such thing when I made the reservation. In fact, I went the no hassle route and used Open Table. As the hostess showed us to our table, we passed by families with young children and a bachelorette bash (the veil clued us in), all of us holding our breath in hopes that we would not be seated near either party. When we were led in to the cheese cave, a small private room where you are literally surrounded by wheels of cheese, everyone looked at me as if I had planned it. I hadn’t, as you know, but was certainly ready to take credit after they kept insisting that I must have done something. While someday I hope that the mere mention of my name will send people running to accommodate ('the best of the best, vino girl is here!') that is certainly not the case today. 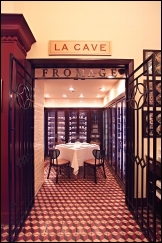 The cheese cave was a great surprise and an even better place to dine with friends on a special occasion. The bistro is loud and you can actually have a conversation in there. If you have a small party (the cave seats up to 5 people) it is worth requesting. You normally have to call in advance to request the room but it just so happens that the party that had it "reserved" decided to sit near the windows. Too pungent perhaps?! While you are not required to order cheese when seated in the cheese cave, it's hard to resist. We ordered a 6-cheese plate and paired it with the 2004 Domaine Terlato & Chapoutier Shiraz-Viognier from Austalia. 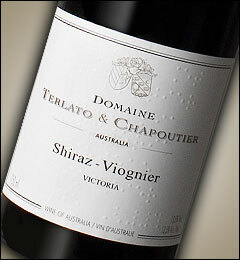 The winery is a joint venture between Anthony Terlato of Napa winemaking fame and Michael Chapoutier of Rhone renown. Although we overpaid for it (Artisanal's wine list is notoriously overpriced) it was a beautifully silky wine with lots of fresh ripe fruit and spice. My first remark was "I hope you like bacon in your wine" and we all agreed that it was in there, along with a dash of smoke. You can find it for around $20 at retail ( I hesitate to tell you that we paid about $56) and I would recommend it for something different with plenty of personality. A "best buy" for sure! Ok, so it wasn't a short post. I think all that wine and cheese went to my head! WOW. That is exciting about the wine. I am on the look out as write this. I just had a Northern Rhone that I got from Astor Wines and it was goiing crazt with the smoke and the bacon. I loved it. Voignier? I am so in.